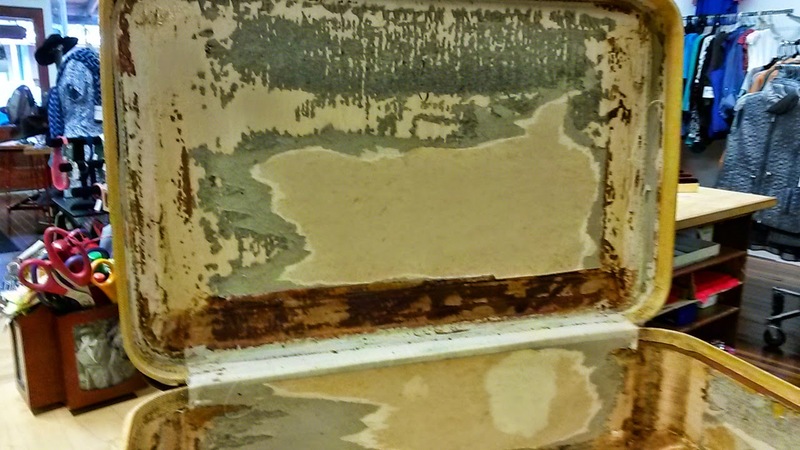 We all love a good vintage suitcase, what is less appealing is the often stained, damaged, musty, or even rusty interiors that my accompany these otherwise amazing pieces. 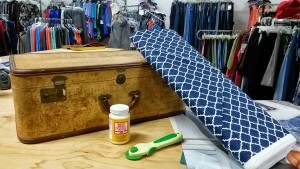 Today we have a tutorial to show you how to breathe new life into your vintage suitcase with just a few materials and a little time! 1.) 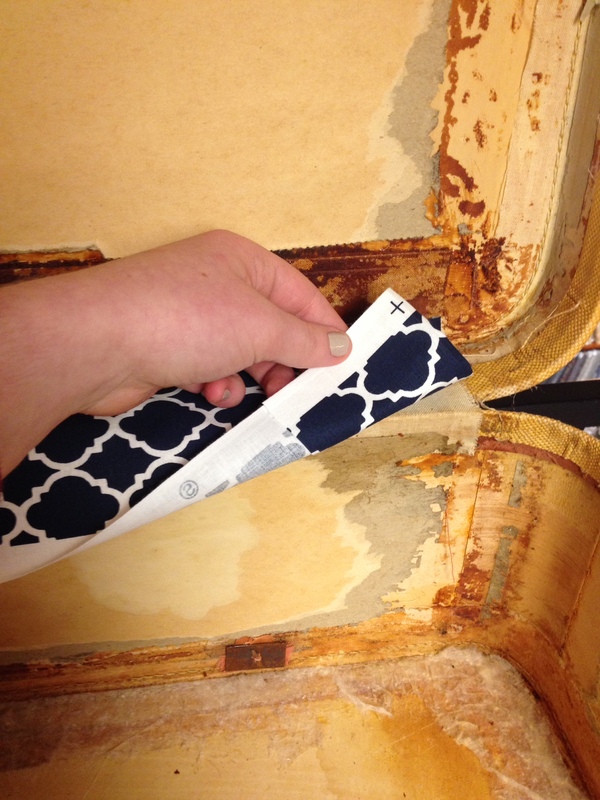 Begin by taking out the previous interior of the suitcase. clean as best you can before proceeding. 2.) 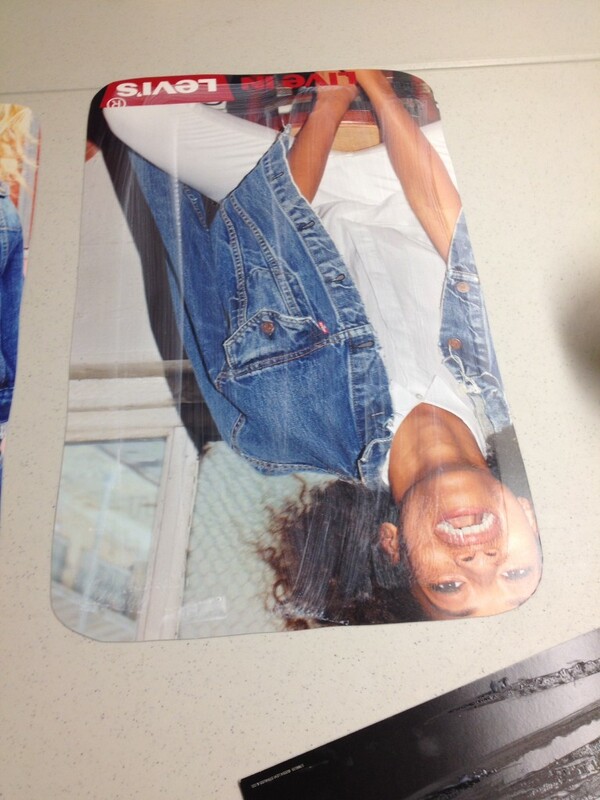 Trace around your suitcase onto poster board. 3.) Measure the lip and subtract that measurement from your original tracing. 4.) 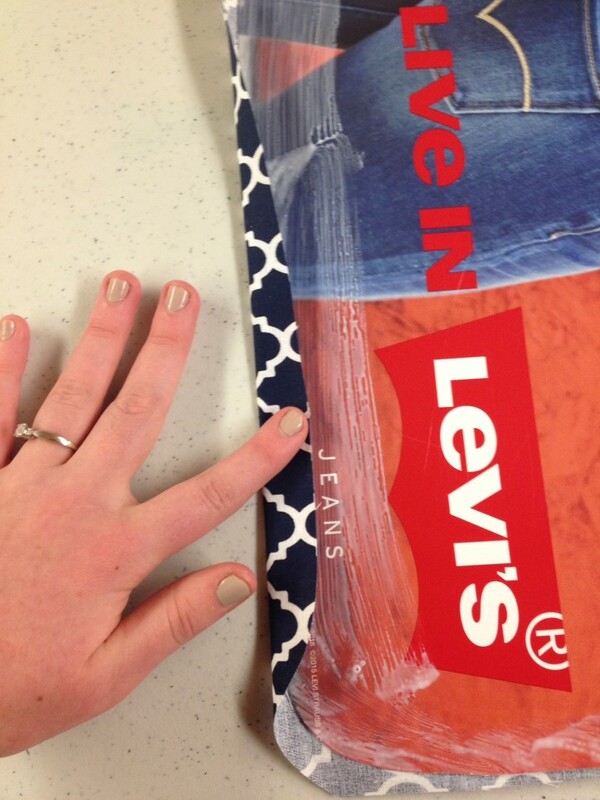 Cut out your poster board according to the tracing, deducting the measurement you took above. 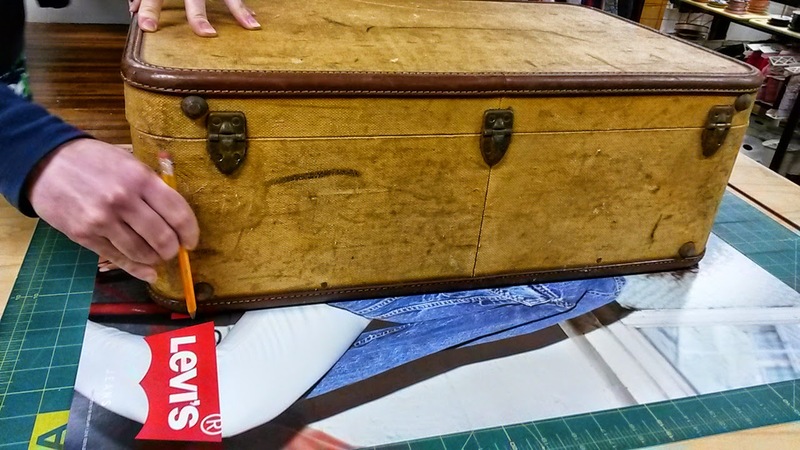 Your finished piece should fit inside the bottom of your suitcase as shown. Cut another piece of the same size for the top of your suitcase. 5.) 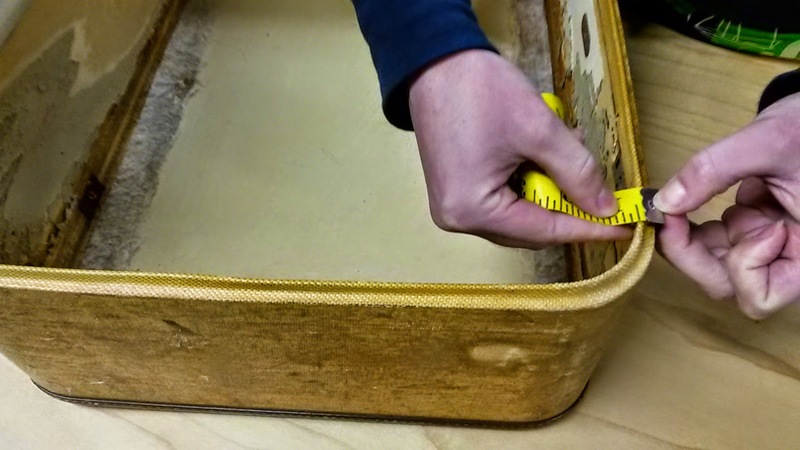 Now measure the depth of the lid and also the depth of the case. Also measure around the circumference of the suitcase. 6.) 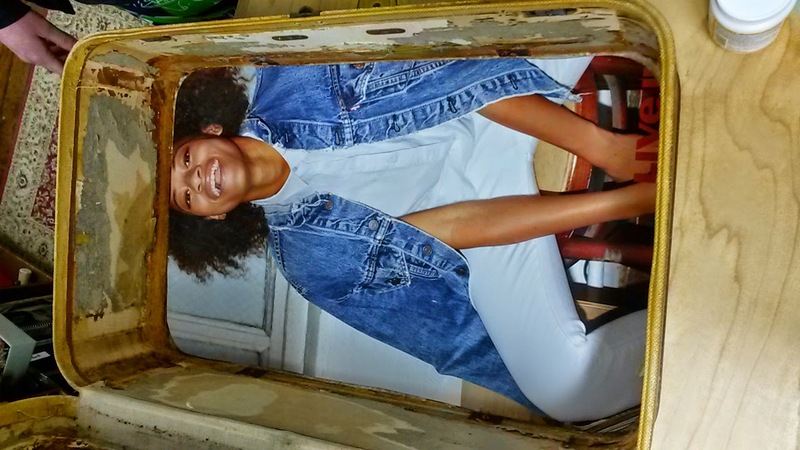 Cut strips of poster board to fit the depth and to the same length as your suitcase circumference plus a few inches more so you’ve got enough to overlap. 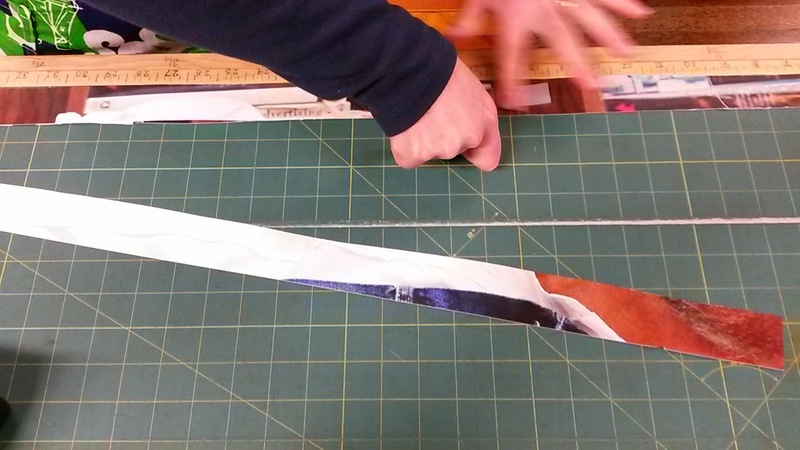 We had to tape a few strips together to make it long enough. 7.) 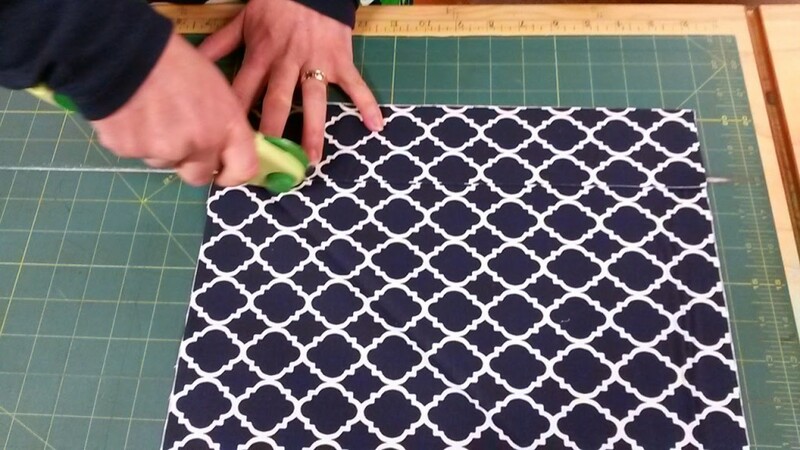 Cut enough fabric to cover all of your poster board pieces. For ours we needed just one yard. 8.) 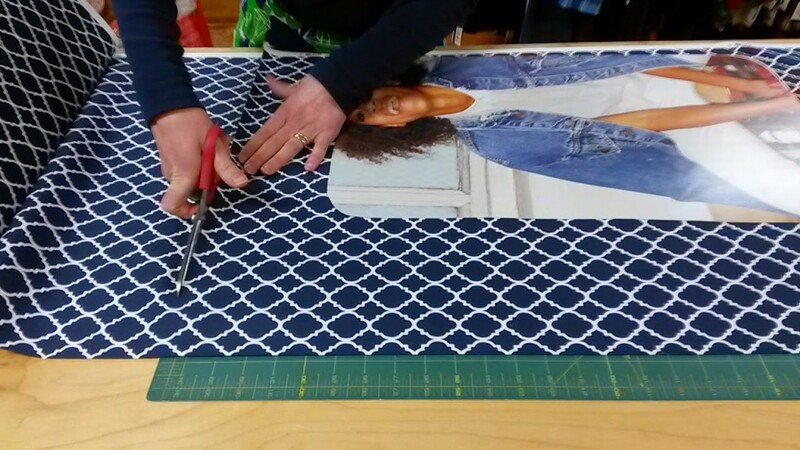 Use your rotary cutter to cut around your base piece leaving an inch or so to be folded over. 9.) 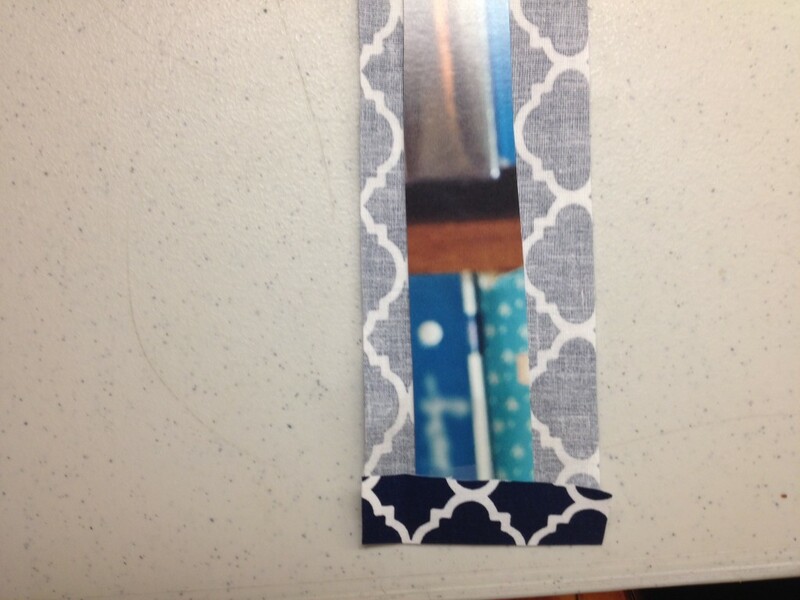 Cut strips of fabric 1 inch or more wider than the poster board strips you cut for the interior walls. 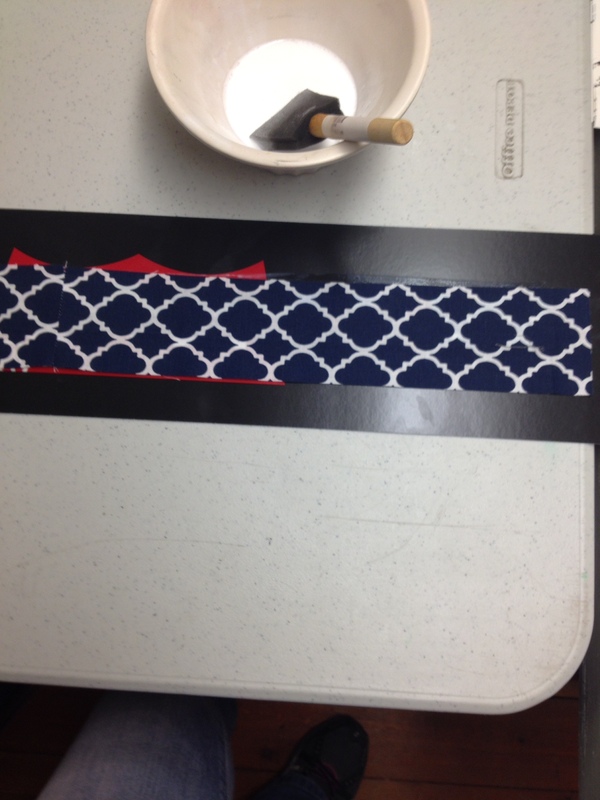 10) With right sides together, sew your strips together until they are long enough to cover your side strips. 12.) 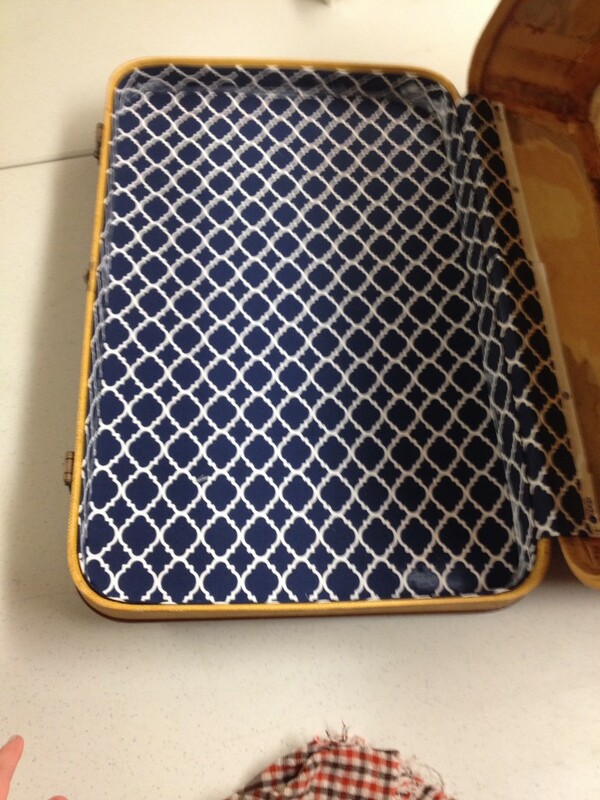 Before we cover the sides we will cover this middle area where the suitcase hinges. 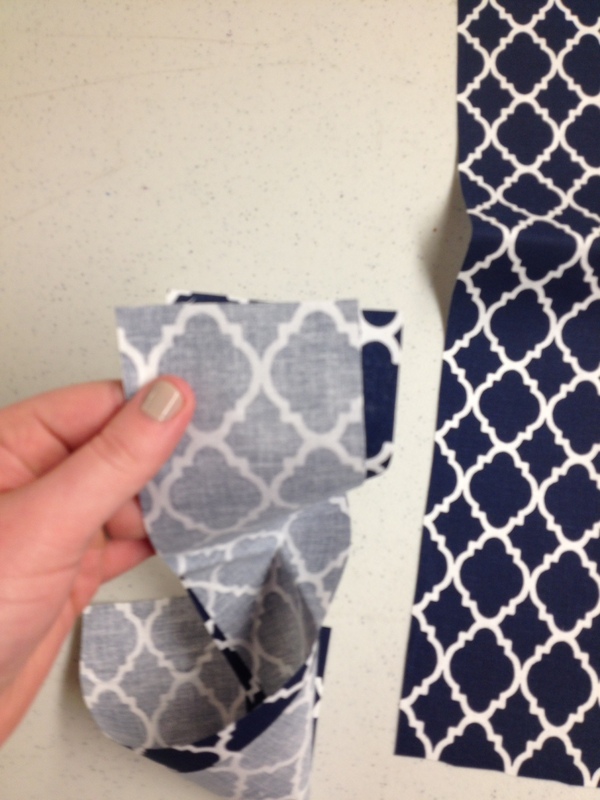 If you don’t have a piece of fabric just the right size, sew two pieces together and iron the ends over to give a finished look to the sides that will be visible. 13.) 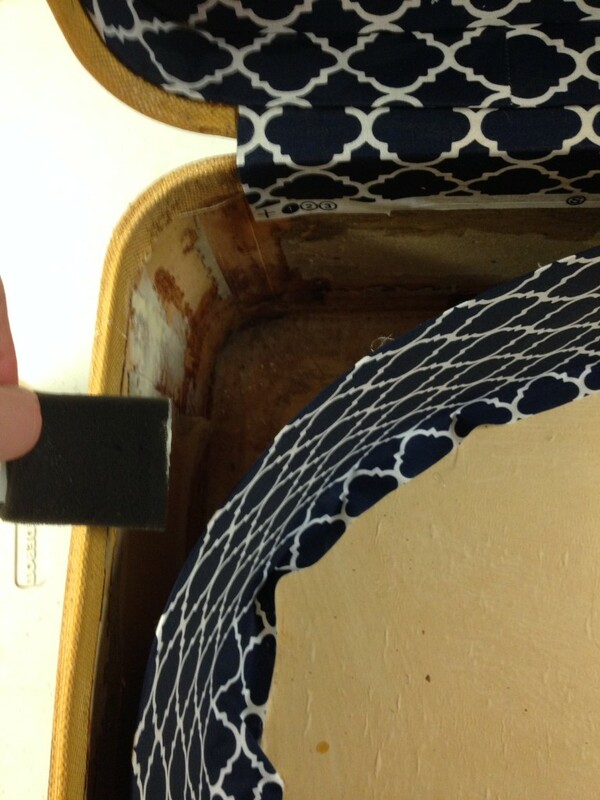 Coat this spot of the suitcase with mod podge, lay your fabric over and press it into the suitcase firmly making sure there are no wrinkles or puckers in the fabric as you do so. Let this dry for a few minutes and then apply a top coat of modpodge to the new fabric. 14.) Get ready to cover your side pieces! Press one end over so that you will have a finished edge. 16.) 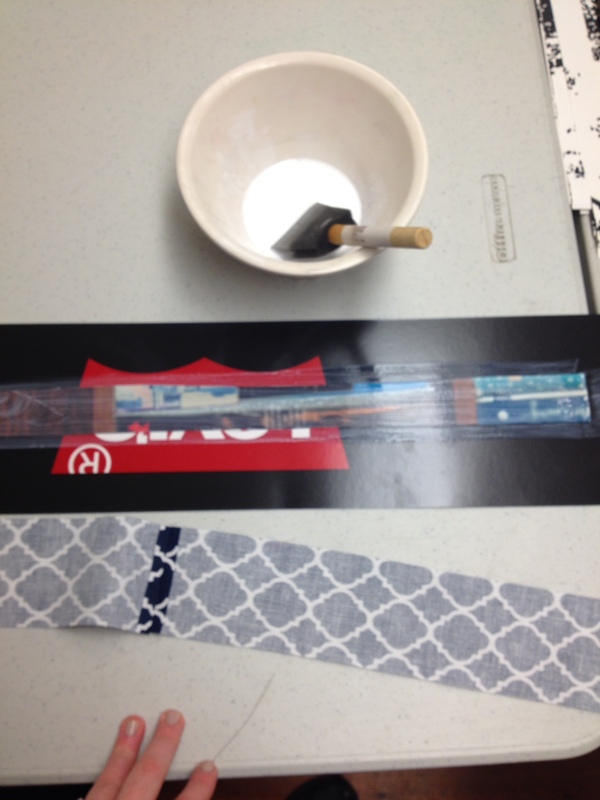 As you apply the mod podge, press your fabric on top making sure to smooth it out well as you go along. Leave a small amount of fabric on one side to be folded over as the top and a longer amount on the bottom (This is so that if there was any inaccuracy in cutting your top and bottom pieces you wont see any gaps). Do this to both sets of sides and set aside to dry. 17.) 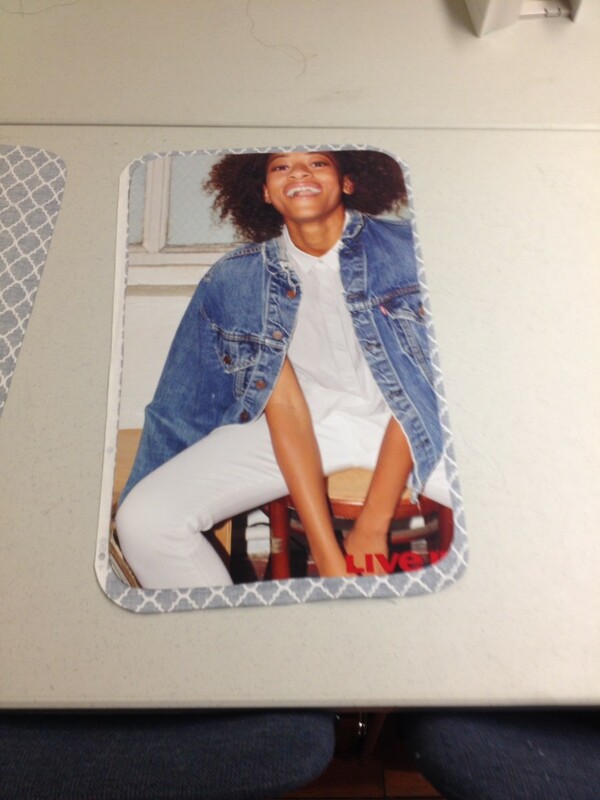 Coat one side of your bottom/top piece with mod podge. 18.) Center and place glue side down on to the corresponding fabric piece (fabric wrong side up). 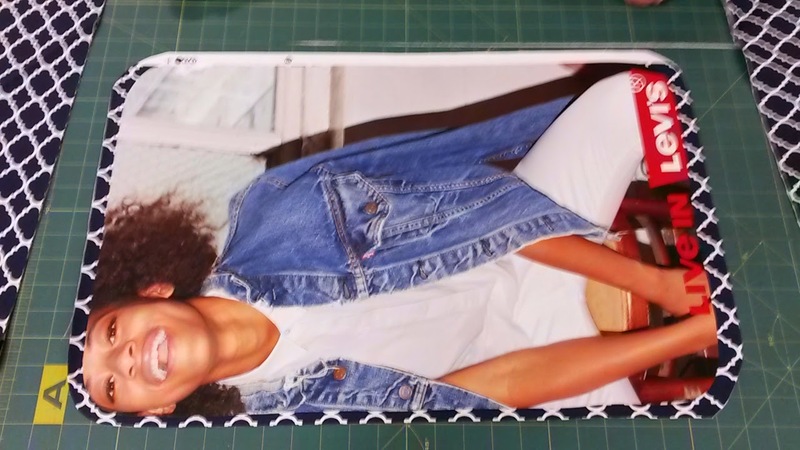 Smooth fabric out and press firmly to make sure it bonds evenly to the poster board. 19.) 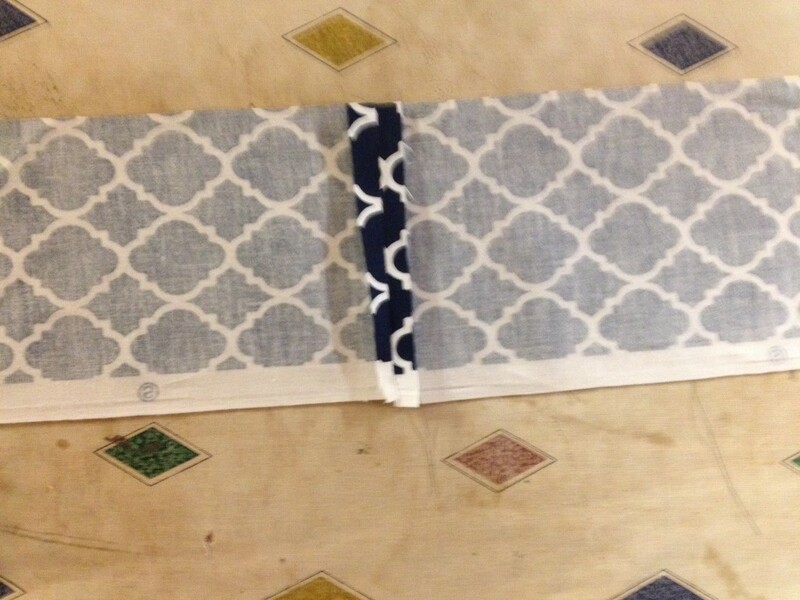 Mod podge around the edges and fold over excess fabric to finish your edges. Repeat on the other base piece. 20.) 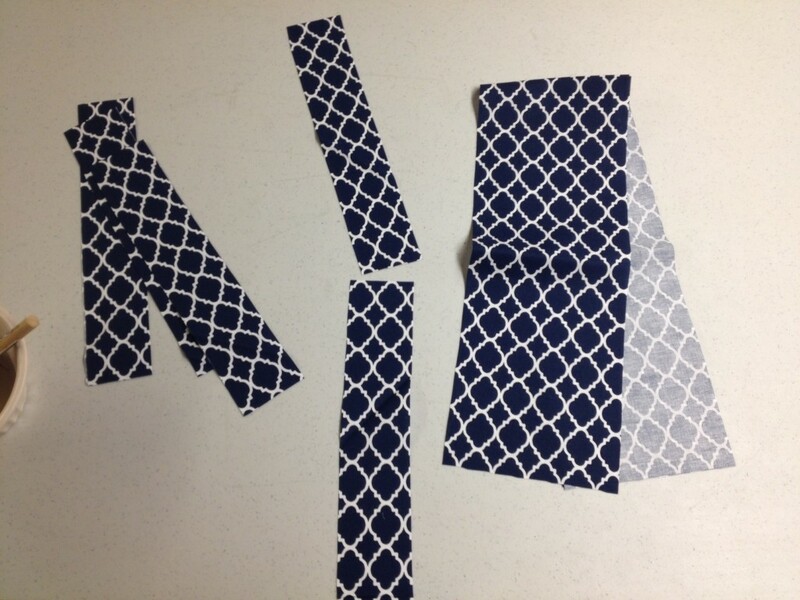 Revisit your side pieces and fold over your top edge just as you did above for the base pieces. 21.) 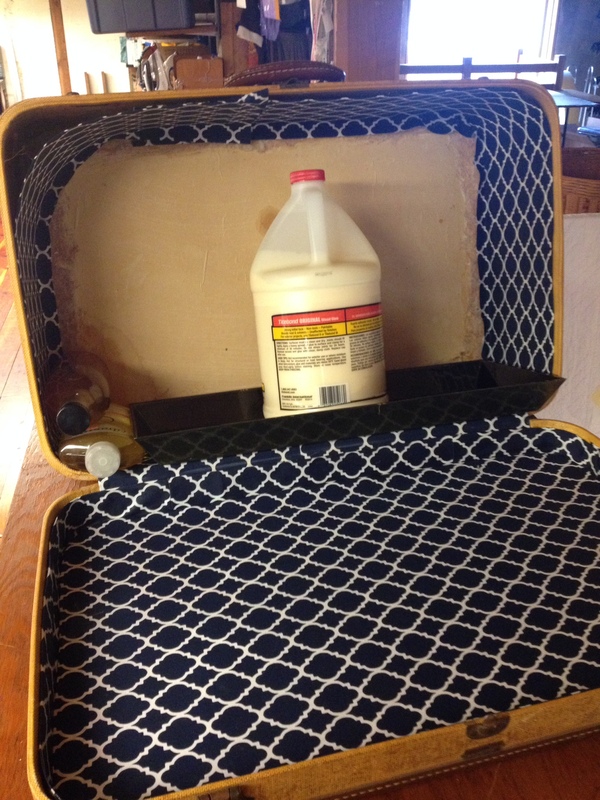 Apply a thick coat of mod podge to the sides of your suitcase. 23.) Place your side piece inside the suitcase, pressing firmly with your hands as you make your way around the entire case. 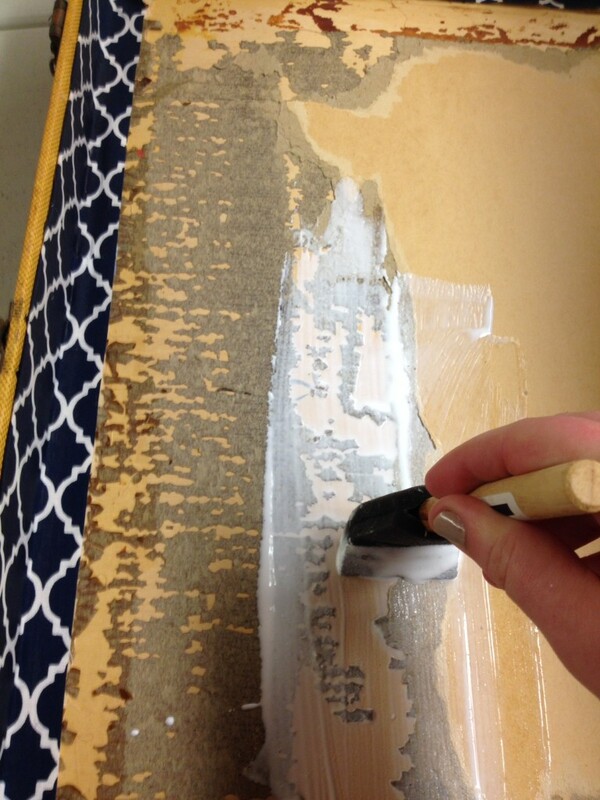 when you reach the end make sure you have a bit of fabric to fold behind the last bit of poster board to create a clean finished edge. 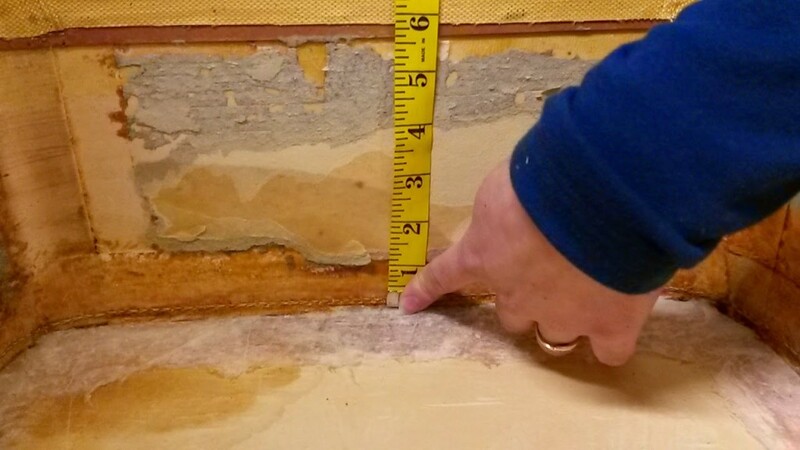 We found that adding weight to each section as we waited for it to dry helped prevent any gaps along our walls. 24.) Coat the bottom (or top) of your suitcase with glue. 25.) 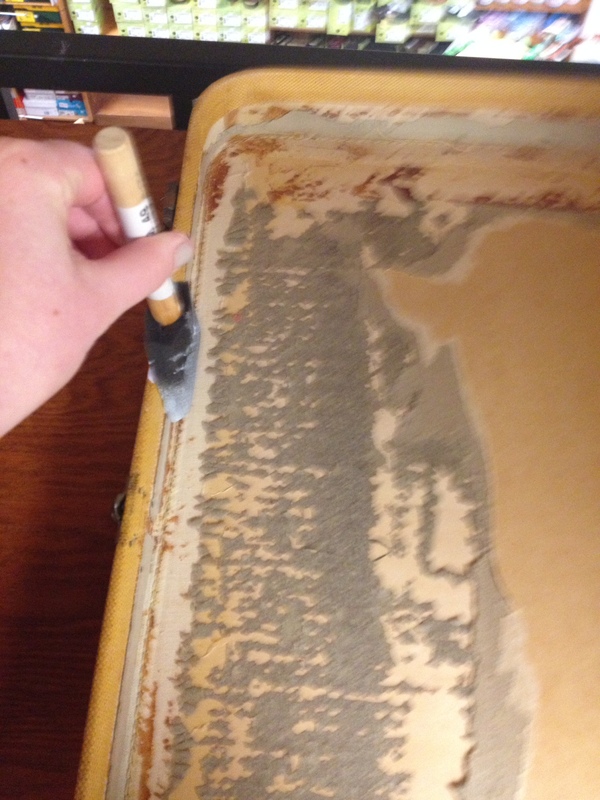 Place your base piece on top and press firmly smoothing it out to insure that it adheres evenly. Repeat this process with the other half of your suitcase. 26.) 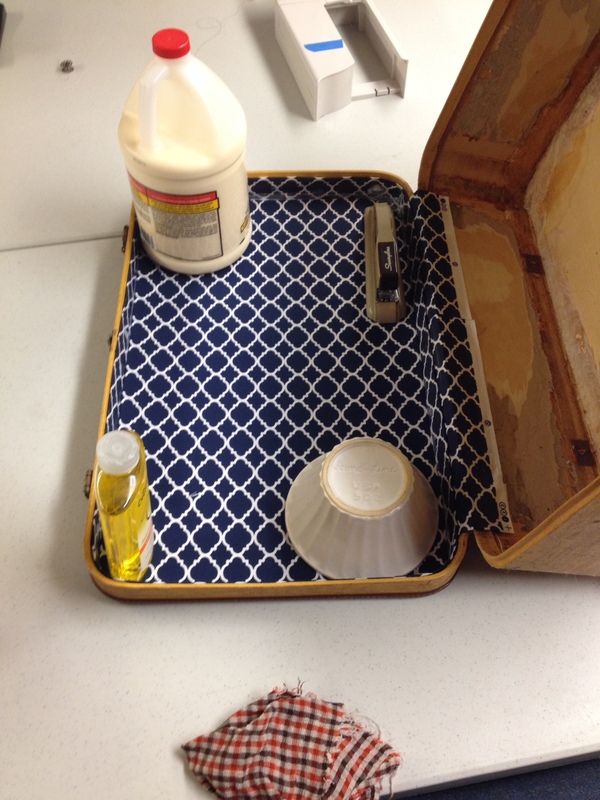 You can also add weights to help it dry securely. 27.) 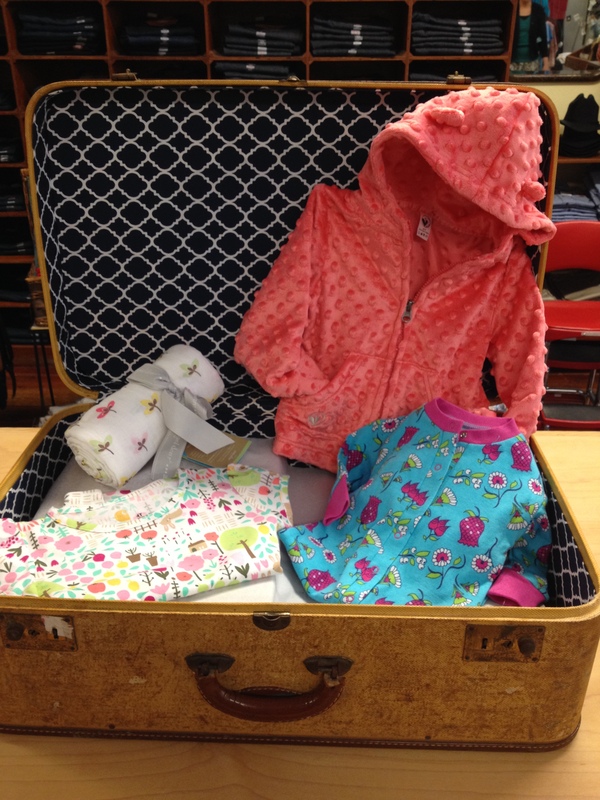 Enjoy a good as new suitcase with plenty of vintage charm! 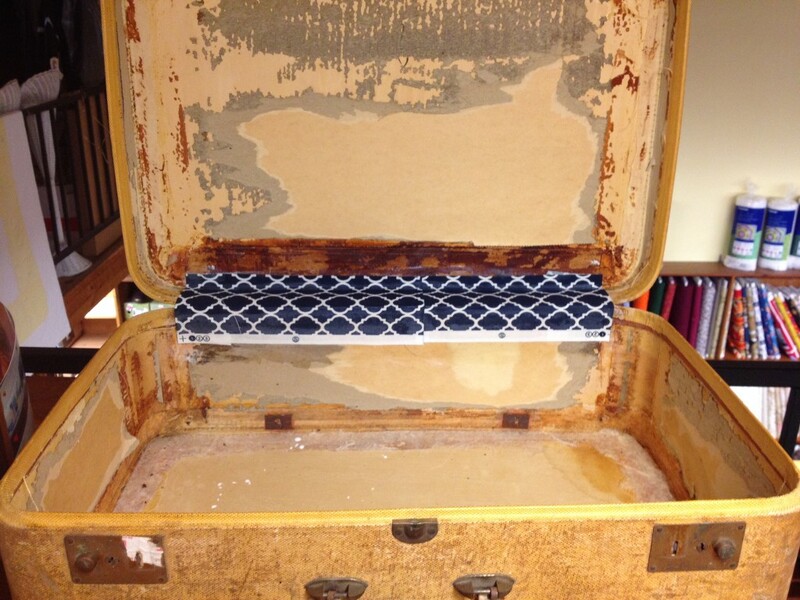 1 Comment to "Vintage Suitcase Update"
This is terrific! I have many old suitcases now I have to decide what fabric to put in which suitcase.